Book club sessions organized by the Party School of the Central Committee of Communist Party of China (CPC) have been restored after a four-year-long halt with iconic CEOs, including Tencent's Pony Ma Huateng, the keynote speakers. This is the first time for private company entrepreneurs to be invited to give lectures at the Party school, also known as the Chinese Academy of Governance. 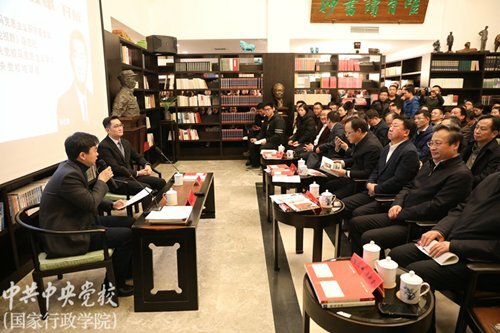 Under the theme of "reform and opening-up, original aspiration and mission," Ma, founder, chairman and CEO of internet giant Tencent delivered a keynote speech based on his business operating experiences, at the 10th Party school book club session on December 17 in Beijing, according to the Party school's official public WeChat account. Ma started with General Secretary of the CPC Central Committee Xi Jinping's important address made during Xi's visit to his company on December 7 and then expressed his thankfulness, ascribing the internet giant's success to the country's great support in communication infrastructure and the country's vast market need and agile market mechanism brought by reform and opening-up. Zhu Lijia, a professor of public management at the Chinese Academy of Governance in Beijing, hailed the Party school event as "a rare but precious two-way communication platform," which could inject confidence in private companies in China on the one hand, and more importantly, help future senior Party officials better understand the private economy and private entrepreneurs' daily difficulties and challenges, while on the other, improving their guidance and management capabilities over private economic sectors in their posts. In the question-and-answer section of the evening, Ma also hailed Party building - a reference to studying the Party's theories, organizing social activities in line with Party doctrine and making Party-related rules - at internet firms. Zhu told the Global Times on Sunday that "successful private companies in China, if you look closely enough, they have all made remarkable Party-building efforts which enhance the company's cohesion and endurance when faced with challenges." Liang Yanshun, deputy head of the Publicity Department of the CPC Central Committee, showed up at the event, alongside two vice-presidents of the top Party school - He Yiting, Wang Dongjing - and about 200 student representatives. Commenting on Ma's speech, Wang said that "the rapid development of the private economy is one of the landmark achievements the country has made during the 40 years of reform and opening-up." Such success could not be achieved without private entrepreneurs' determination and innovation, Wang said at the book club session. It was the implementation of reform and opening-up that created the success of Tencent and Ma Huateng, of Jack Ma Yun and Alibaba, He noted. The list goes on, he said. He said it was crucial to hold internet industry activities at the Party school to popularize knowledge and its applications. "It is in fact part of the 2018-22 Party officials cultivation program to increase the students' capability to understand cutting-edge technologies such as big data and cloud computing." According to Shanghai-based news site thepaper.cn, the Party school book club sessions were launched in April 2012 and the event was dormant after 2014. A renowned scholar will be invited to each session to deliver insightful speeches on hot issues including politics, economics, culture and Party building, and the scholar will interact with the audience in the form of question and answer. Dong Mingzhu, chairman and CEO of China's biggest air conditioning maker, the State-owned Gree Electric Appliance, was invited for the event under the same theme on December 7, the first session since 2014. Such a top Party school event having successful entrepreneurs as lecturers sends a strong signal about releasing the economic vitality of the private sector, Sun Lijian, an economics professor at Shanghai-based Fudan University, told the Global Times on Monday. Deepening the country's reform and opening-up has become one of the top-priority topics in Party official training and future governance, Sun said. According to Wang, half of the country's tax income comes from the private sector, as well as 60 percent of the GDP, 70 percent of innovation outcomes and 80 percent of employment. On November 1, Xi, also the Chinese president and chairman of the Central Military Commission, underscored that the country will unswervingly encourage, support and guide the development of non-public sectors and support private enterprises to develop a broader stage, when presiding over a symposium of private enterprises at the Great Hall of the People in Beijing, the Xinhua News Agency reported.